When Tvesla’s Demo ’05 came out, it was already the year 2008. That same year, they recorded the songs of IV which saw the light of day two years later. As of now, the band is on ice. They even abolished their Myspace page, so that right now they can only be reached by email. The Luxembourgish three-piece was founded in the early 2000’s and released, prior to the aforementioned EP a split-7” with Eyston and a split-10” with John McAsskill, coincidentally also two bands that are no longer around. 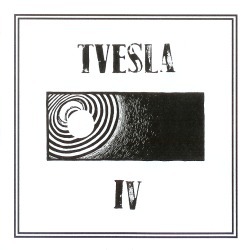 Tvesla must have thought that their last material deserved to be featured in their rather short discography, and after repeated listening, I can only agree with them. Don’t expect anything unprecedented on IV, as the band continues in its vein of instrumental noisy proto post rock, accentuated once again with a transparent but very jarring production that makes you imagine being in the rehearsal room with this band that was always at their best live on stage. IV contains five regular tracks, all running between five and ten minutes, typical of Tvesla’s unbridled songwriting procedure. The wild guitar is counterpointed by an abrasive bass and a freewheeling drummer. In fact they were always a three-piece taking care of giving equal space for every musician involved, which prevented their music from sounding bare or boring. It doesn’t make much sense getting into the details here, apart from the unlisted bonus track, a remix of the preceding Videoid, remixed by Urbs in a way that gives a whole new dimension to the custom Tvesla sound. The remixer is taking the bare ingredients of the music, which always had a somewhat angular quality, and adds his own more straightforward beats and a signature bass line that make this track something entirely new. As Tvesla is on hold right this moment, they should consider releasing a remix album until maybe someday the three musicians find back together. Until then, IV shows the noisy rockers at their best. Let’s hope they find some interested ears, despite their low profile on the Internet.